Hurricane Maria devastated Puerto Rico and its economy last year. As the island rebuilds, one theme has become apparent: Puerto Rico's infrastructure needs to be better than it was before. Restoring our systems to the pre-hurricane status quo is not an option, especially when it comes to critical sectors like telecommunications. As the founder and executive director of the National Puerto Rican Chamber of Commerce, a group dedicated to increasing innovation and supporting businesses on the island, my team and I have become closely involved with the promotion and deployment of advanced telecommunications systems that will serve Puerto Ricans for decades to come. As an economist, I recognize the importance of consumer choice and competition in the marketplace. More competition not only stimulates the incentive to innovate, but also puts substantial downward pressure on the cost of service. For wireless consumers everywhere, this dynamic means more data and better coverage for less money. As the cost of living continues to rise on the island, it's important to support companies that are working to keep more money in the pockets of Puerto Ricans. So, what does a competitive wireless marketplace look like? Today, Liberty Cablevision of Puerto Rico, a subsidiary of Liberty Latin America and Puerto Rico's largest fixed-line provider of high-speed broadband and video services, offers access to more than one million homes, or approximately 70 percent of the island's households. No other fiber-based broadband internet service provider competes with Liberty in Puerto Rico, according to Liberty's filings with the U.S. Securities and Exchange Commission. Claro offers DSL-based fixed broadband service and AeroNet and HughesNet offer satellite-based broadband service, but these companies' broadband offerings are slower than Liberty's service, are subject to data caps, or both. Meanwhile, two wireless companies, AT&T and American Movil's Claro, held 60 percent of the wireless market in 2017, according to one report. Three other providers, T-Mobile, Open Mobile and Sprint, vie for the remaining 40 percent of the market share. Liberty's deep market penetration and vertically integrated service offerings–combined with its network of more than 800 miles of broadband fiber infrastructure–pose a serious challenge to broadband competition in Puerto Rico. Liberty holds most of the inputs needed to deploy mobile broadband services and– unless challenged –threatens to dominate the mobile broadband market, too. T-Mobile has the capacity to disrupt Liberty's near monopoly over fixed broadband. In 2016, T-Mobile acquired 50 megahertz of the valuable low-band spectrum needed to deliver service across Puerto Rico. T-Mobile's merger with Sprint will allow the combined company to leverage its low-band coverage spectrum with the rich spectrum portfolio Sprint already holds to more rapidly deploy highly anticipated 5G across Puerto Rico and the U.S. mainland. 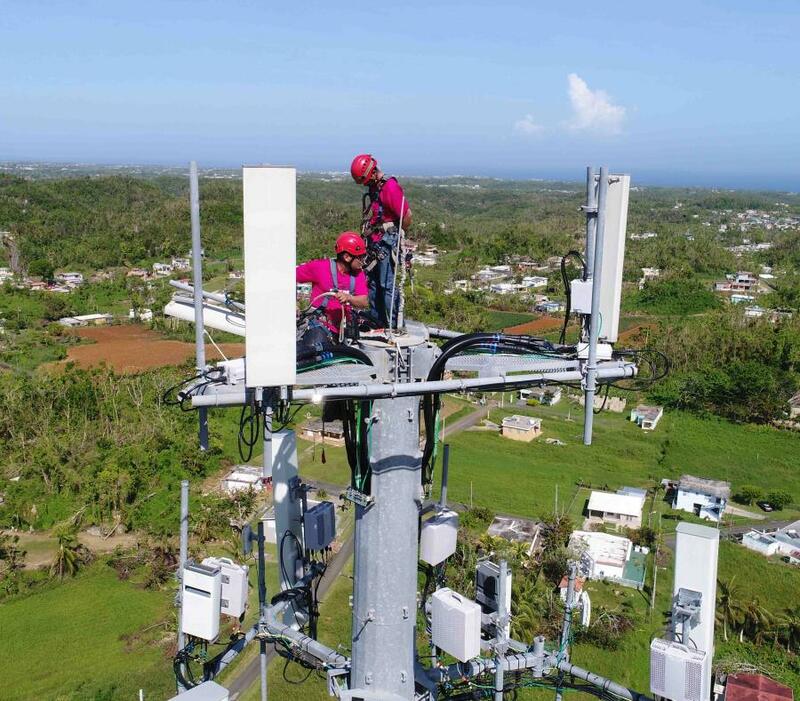 The New T-Mobile's 5G mobile broadband network will be able to compete with Liberty's service to offer Puerto Rican residents another option for high-speed connectivity while helping to drive down costs. The high speeds and low latency of T-Mobile's new network will enhance capabilities in business, healthcare, and education—three critical components for a strong Puerto Rican revival. 5G offers speeds far faster than today's networks. It will allow us to stay better connected to the world around us and enable our participation in the rapidly proliferating "Internet of Things." Farmers on the island will be able to use the latest smart agricultural technology, helping to increase crop yields and make the island more self-sufficient. A sick resident in rural Santo Domingo will be able to speak with a doctor via telemedicine. And in San Juan, young entrepreneurs can count on a consistent internet connection to Skype with investors on the mainland. 5G will help carry Puerto Rico into the future. As recovery efforts continue, more competition—and the deployment of better, more advanced technology—will help Puerto Rico's telecommunications systems perform better and be more resilient in the face of natural disasters. Equally important, more competition and more infrastructure deployment will help support the types of economic growth and development that the island sorely needs. Justin Vélez-Hagan is the founder and executive director of the National Puerto Rican Chamber of Commerce. He has also served as an adjunct professor of economics at the University of Maryland and is the author of the book The Common Sense behind Basic Economics, as well as the upcoming The Paradox of Fiscal Austerity.